Returning to the natural beauty of Carson Creek Ranch, Austin Psych Fest again astounded concert goers from around the world. The acts, composed of an eclectic spectrum of like minded artists ranging from styles of neo-psychedelic pop, electronic experimentation, dissonant songwriters, jam prone rockers as well as extensively influential classic acts. Now in its seventh year, Austin Psych Fest began as a single evening of like minded bands performing in a small club. Gradually expanding year after year through various Austin clubs and warehouses, Austin Psych Fest has found an idyllic spot on the picturesque banks of the Colorado River. Featuring three different stages with unique atmospheres, the Reverberation Stage with evening high powered psychedelic projections, The Levitation Tent with classic oil-style projections or the especially captivating Elevation Amphitheatre, a grass covered bowl hewn into the riverside bank. The river stage especially set the unforgettable tone of the festival with its elegant emerald background of the Colorado River. Late evening performances including interlude music from croaking frogs and psychedelic patterns borne on clouds of moths fluttering in the evening’s coloured stage lights. 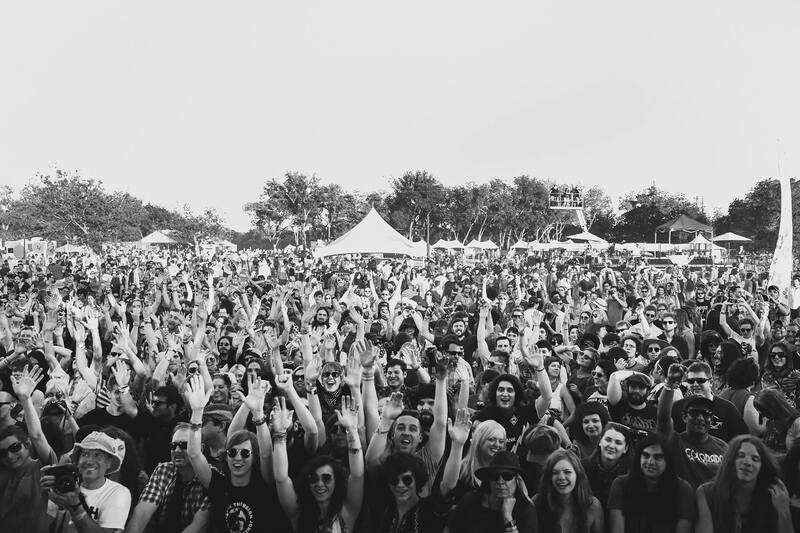 The festival provided a welcoming and festival atmosphere for all attendees, ranging from enthusiastic Austin locals camping out at the festival site, all corners of the USA, more than a few Canadians and countries from throughout the world. Austin Psych Fest is uniquely a product the original birthplace of Psychedelic music, the high calibre of the diverse and intriguing acts, an easy-going, art-centric and accessible festival setup and inviting nature of the city of Austin. This year’s line up, featuring The Black Angels, The War on Drugs, Panda Bear, Loop, The Black Lips and the Brian Jonestown Massacre, Austin Psych Fest also showcases many hidden gems from throughout America including dreamy Neil Young like guitar of New Hampshire based Doug Tuttle or the progressively building fury of Boston band Perhaps. The festival also features a special emphasis on up and coming international acts. Tuareg artists Bombino and Terkaft respectively captivated audiences; the infectiously high spirit of Peurto Rican group Fantasmes had no trouble gaining an attentive audience despite performing early in the afternoon on Sunday. The Festival offered an affordable and adjacent campground, a place occupied by friendly and respectful psych enthusiasts, travelers from afar, and at least one friendly group of friendly camping in a school bus that would fit right in Tom Wolfe’s Electric Kool-Aid Acid Test. The friendliness of the atmosphere amoung campers was palpable given the fantastic and mature culture of music in Austin and the mindful and good natured logistics of the festival. On Friday Christian Bland, guitarist, vocalist, songwriter and festival organizer personally stood and handed out printed concert schedules as folks wander from stage to stage. “You know how preachers stand and give out pamphlets at Church? This is just like that!” laughed Christian. Delicious local food trucks, Juiceland, Stylish vintage clothing booths and oddity vendors satisfied and intrigued concert goers. Of special note are the fantastically trippy posters of Psychedelic festival artwork as well as the incredible and affordable selections of LPS from the Festival’s Record label the Reverberation Appreciation Society. San Francisco’s Committee To Keep Music Evil also offered selections of choice picks like the Brian Jonestown Massacre original demo cassettes, LPs and 45s. Both Record labels hosted club pre-parties at Austin clubs Mohawk and Red 7 with intimate pre-party performances on the night before the festival, featuring bands such as Holy Wave, Elephant Stone, Night Beats, Asteroid #4, The Flamin Groovies and the Warlocks. Though the standard of music at the festival consisted of an unusually high calibre of quality compared any other commercial rock festival, the atmospheres generated by the sum of the exquisite psychedelic lightings, happy spirits of concert watchers and particular knock-out performances must be mentioned. The Brian Jonestown Massacre and Dandy Warhols, subjects of the incredibly entertaining but misleadingly framed awarding winning music film Dig! were both present at the festival and performed a brilliant rendition of the “Oh Lord” from 1996’s Take It From The Man!, rightly regarded as an incredibly influential masterpiece album, on Friday’s Reverberation stage. The Black Angels performed the present version of their ever evolving live show featuring mesmerizing visual psychedelic projects supplied by Bob Mustachio, who also plays drums with Christian Bland & the Revelators. The most excellent and meandering haunts of “Linda’s Gone,” the final song from the Black Angel’s recent Record Store Day release Clear Lake Forest confirmed the cool and creative endurance of Christian Bland, Stephanie Bailey, Alex Maas and Kyle Hunt. On Saturday, Unknown Mortal Orchestra converted many new fans with an especially ripping and dynamic set following rising UK psych stars Temples. The Brian Jonestown Massacre’s set included the newly penned “What You Isn’t,” a binding sonic undercurrent with a wonky but infectious hook soon to be released on the upcoming album Revelation. Following the heavenly groove of “Anenome,” bandleader Anton Newcomb spoke about the endless opportunities to create music art and music: “You don’t need anything except your imagination,” he encouraged. Moments of particular reverence on Sunday included a hypnotic sitar set from Rishi Dhir of Elephant Stone and a richly intriguing performance from The War on Drugs playing their new record Lost in the Dream. Panda Bear’s set followed with dazzling and perplexing sound scapes before the night closed off with bold and bombastic tones of English group Loop’s guitar riffage and some of the most terrifying and strange projections from Tobacco’s set in the Levitation Tent. San Fran group Sleepy Sun delighted the audience on the river stage but it was not until after 10:15 pm, when the Acid Mothers Temples ascended to the stage, that the psychedelic limits of the audience were put to the test. The eclectic artistic success of Austin Psych Fest makes one recall the idyllic 1967 Monterrey International Pop festival curated by John Phillips of the Mamas & the Pappas. Austin Psych Fest may be the closest destination such a living concept; Jimi Hendrix’s ghost must have been present as cosmic Japanese Psych rockers Acid Mothers Temples set aflame their drums and madman Kawabata Makoto waved his flaming guitar towards the night sky in defying ritual. An inclusive atmosphere, DIY attitude combined with gorgeous ranch setting, unique vendors, tremendous talent and variety of eclectic artists distinguish Austin Psych Fest from other music festivals. The warmth of the Texas sun, the opening and inviting nature of the festival both contribute to the unforgettable experience of the festival which has somehow managed to encompass the best aspects of the modern and the past. The striving effort of romantic artists to play to their limit and perform their absolute best all “It’s the fans who decide who plays, they tell us” said Alex after the festival as he sat under the early morning Texas stars and hung out with campers. More Acid Mothers Temples please.